The AdWords Campaign Report helps internet marketers determine how well AdWords is working to bring traffic to a website. In order to get to this report, the AdWords and Analytics accounts must be linked. To link the AdWords account to the Analytics account, follow these steps. Step One: Login to your AdWords account. Step Two: Click on the Analytics tab. Step Three: At the bottom of the page, click "I already have a Google Analytics account"
Step Four: Choose your Analytics account from the drop-down menu. The screen shot seen here represents an account without a linked AdWords account, but will allow you to see what you should be seeing if you have arrived at the correct report by clicking on Traffic, then click on AdWords, and then click AdWords Campaigns. Pages per visit: How many pages does each visitor look at? Percentage of new visits: How many of these visitors are new, fresh, never having been to the site before? Bounce Rate: How many of these visitors come to your site through the campaign and then leave because they didn’t mean to come there or didn’t find what they wanted at your site. By looking at the data on this report, you will be able to see how visits are coming in from your AdWords campaigns. If the campaign is bringing in good traffic, you may decide to increase the money you are spending on the campaign to bring in more. If the campaign is not bringing in good traffic, you may want to look at the Keyword Positions report–detailed next in this series–to determine if you need to increase your advertising or change your keywords. Overall, the information here will help you in making sure your return on investment, otherwise known as ROI, is the best it can be. Google Analytics includes the nice feature of integrating your AdWords account with it. 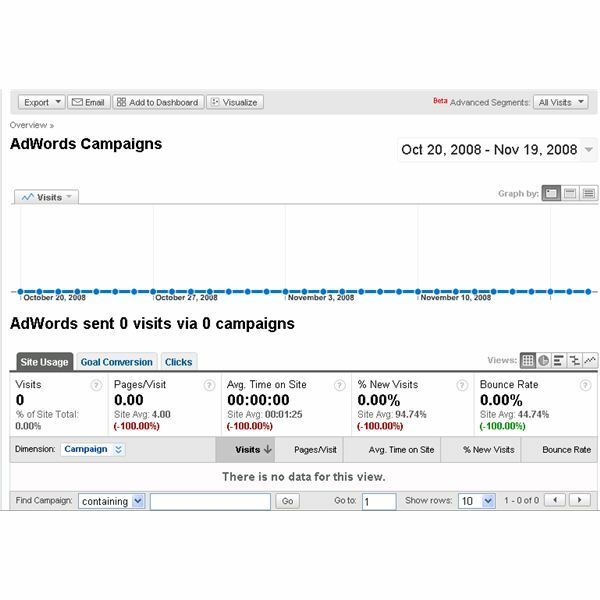 Analytics will provide you with data on your AdWords campaigns to help maximize your results, and optimize your budget.